I'd like to configure 3 jobs for the organization, 1 job to handle mailboxes, one for SharePoint sites, and one for OneDrive. Is it possible to do what I am looking to do? Note that I opened a case with Veeam support on this (03240992) and they had no suggestions..
You can add the entire organization and instead of exclude you select which items you want to process on the "select items to backup" tab by going to Edit. This way which you choose 1 of the 4 things you want (or multiple) to backup in the specific job. This way you don't have to worry about new things being added, not being backed up as this way every new onedrive, mailbox, sharepoint site,... will be backed up. Following on from this, is there a way to include all new Teams sites/channels in the job, but exclude all Personal sites? At the moment we have the teams sites checked individually because we don't want to back up the entire organisation's personal sites as well. Obviously there's a risk of a Teams channel being added, but not getting included in the backup unless we check on a regular basis. Thanks !! Not sure if I follow, but team sites don't have personal sites? Personal sites only belong to users. 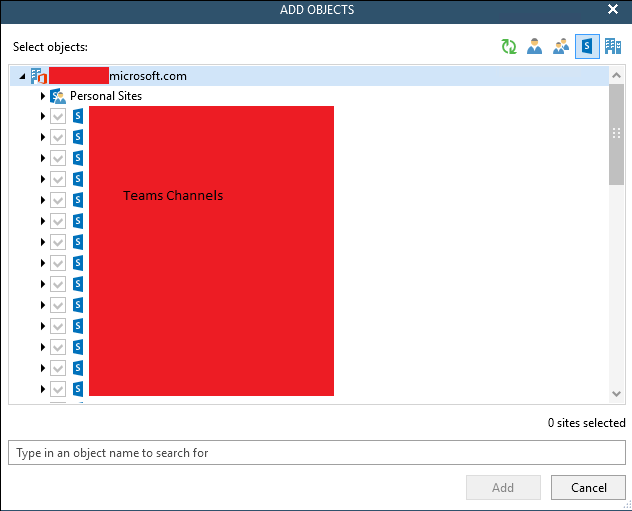 Sorry, maybe I didn't explain it right ... As Teams uses a Sharepoint back-end, so the channels show under the Sites section in VBO. What I need is for all the Teams sites to be automatically added to the backup list, while the Personal sites to be automatically excluded. Hi Mike. I already know that. The issue is when someone adds a Teams site in the business, it's not automatically backed up by VBO unless I check the job on a regular basis and manually enable the checkbox by any new created channels. I need this to be automated so we don't need to manually check, and reduce the risk of things not getting backed up. At the same time, I don't want Personal sites to be backed up in this job. It seems at the moment VBO only offers "all or nothing" as automated? Ah, now I think I understand it better... Mea Culpa, that's my bad. So, choose the selection criteria and then add the organization. This will look like you are doing exactly the same as selecting everything but then on the next page of the wizard, in the exclusions, exclude the personal sites of the users (and whatever else you want to exclude). Then you will have everything in your environment but personal sites excluded. If you add entire organization in the selection criteria, I think you can then click on the "Edit" button and exclude personal sites from processing also. But will need to verify to be sure. Unfortunately it doesn't appear you get the option to exclude all personal sites automatically either. We can back up the entire org, and exclude personal sites on an individual basis, but again we're in a position where we have to keep editing the job to add exclusions (and as we're a reasonable large organisation with people coming and going, it'd be more work than just including the Teams sites every few days). I think there needs to be more of a differentiation between "Sites" and "Personal Sites" in the software to make this happen (ie have them as their own categories, rather than placing Personal Sites under the main Sites heading)? As it isn't in the GUI right now, would it help if we (as a workaround) provided a powershell script which you could run via windows task manager? Is that powershell script available publicly? I have a similar setup I have going for a client and want the Mailbox + OneDrive in one Job and only Organizational Sites in a second job. I've not received the script myself yet. Hopefully someone is working on it?